I can't believe how much my life has changed since the fateful day I pulled up stakes in New York City and moved to western New York State to have a look at and try to sell my grand old American castle. I had no idea what wonderful weirdness was about to enter my life. But I've been relating my adventures one by one, including that most exciting adventure of all, falling in love with one hunky once-sheriff-now-private-eye Virgil Grace. But my lovely friend Pish Lincoln has ratcheted up the weirdness to Level 13 by inviting to Wynter Castle the cast and crew of an infamous reality show, Haunt Hunt. He had, he tells me now, some odd experiences in the castle while I was in Spain, and called a friend who referred him to the Haunt Hunt producer, who put him in touch with one of the investigators. He didn't intend to invite them to Wynter Castle, but... there it is. It happened. Arriving home from a 'vacation' (Ahem... more about that another time!) with Virgil in New York City I was astonished to find, parked in my drive, a full television crew and the paranormal investigators of Haunt Hunt. A few hours in I knew we had trouble. They are like the worst dysfunctional family you've ever met; argumentative, manipulative, intrusive.... all the worst 'ives', as a matter of fact. If fish and company stink after three days, TV crews and psychics have a best before date of yesterday. That doesn't even make any sense but I'm tired and they film at night and I want my castle back! We'll be lucky if we all survive the three days or so they say the shoot will take. Oops... hope I didn't jinx it, but I'm fed up with the lot of them, especially the so-called psychic Dirk something or other, who is some piece of work, and who clearly has ambitions beyond their funky little paranormal investigation show. So... have you ever had unwelcome guests? What did you do to make the experience better... for you, not them? It all goes from bad to worse when the show's psychics claim to have contact with people murdered on Merry's property. When two cast members are found dead, Merry and Virgil must figure out who’s picking off the Haunt Hunt team before their hard-earned happily ever after is cut short. 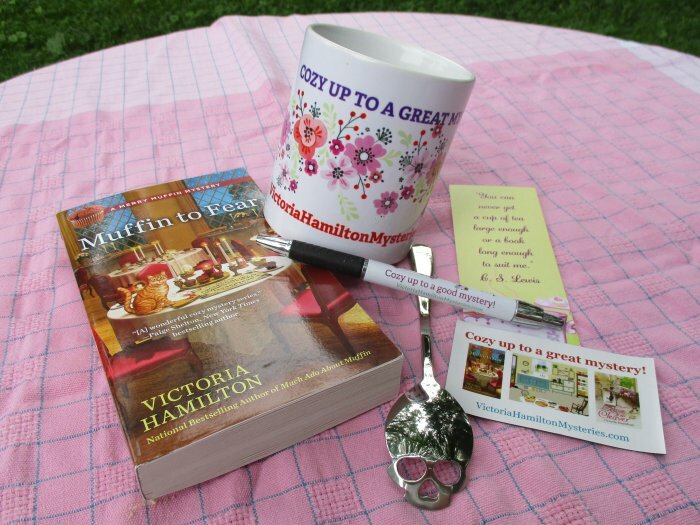 For more information and to sign up for Victoria's newsletter visit Victoria Hamilton Mysteries, or find her on Facebook or Twitter! 1 - Canadian and US entries welcome. Sounds wonderful. The title is so clever. I am so looking forward to Muffin to Fear. It's been preordered for a while now. I've had an unwelcome guest and it was terrible. I did what I always do when the world is not to my liking. I read a whole lot. No unwelcome guests here - just the kids returning for a visit now and then! When they were here last it seemed like I followed them around 24/7 turning off the lights..... Love the giveaway. I've never really had an unwanted guest, thankfully. I love this series and can't wait to read the book! Melissa. mcastor07(at)gmail(dot)com. What a great giveaway !! Thank you for your generosity. Good luck to all ����. Can't wait to read the book. Love cozy mysteries!! Would love to win! Especially that spoon. I have had unwelcome guests that had to stay for at least a month. It was terrible but we all made the best of it. I just made sure to get some alone time. Thank you for the chance. This summer we have had unexpected guests. So we didn't have food ready for meals so we ended up ordering out. Although the unexpected guests that came recently just joined the crowd of expected guests and we had food enough for everyone. So it has turned out to be a good time and not a problem. I would love to win your great prize package! I don"t have a castle, so with more limited space, certainly don't have the quanities of welcome or unwelcome guests Merry has! Can't wait to read her new story! Thanks for the chance to win! Sounds awesome... Love the cover! Love your books thanks for a great giveaway. This sounds like another great installment in this entertaining series! I've had to entertain an unwanted guest (a wicked aunt) but she was not staying with me, just visiting my home for a few hours...that was long enough when you're "unwanted and unwelcome!" Looking forward to this read! Can't wait to read this one! Thanks for the giveaway. Grin and bear it is my attitude! Thankfully this doesn't happen often. We love our guests! Can't wai to read the latest book in the series! I already own two of the books in the series and need another coffee mug. We totally enjoy the series and the recipes (which I share with DD#2 the baker). Pretty please pick me? I love your Merry Muffin series. I'm not sure I've ever had unwelcome visitors. -- except for those pesky piss ants as my daddy called them; bugs & spiders of all sorts; mice. Of the human variety, i may worry about having them come, but one here, it is all good. Love your books. Cozy mysteries are the best. Cozys are my favorite I would love to win. Looks like a great read and that's a great giveaway. Just grin and bear it and tell myself they don't live her permanently (and keep reading when I can). Not sure if I was the winner - didn't see any notifications and didn't get an email, but I just received a copy of Muffin to Fear from the UPS delivery, so if it was from here THANKS! Awesome giveaway! The book sounds interesting! I love Everything you have Ever written. (True). 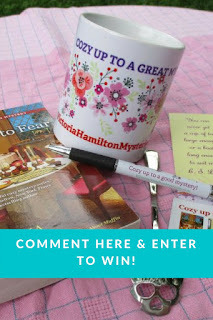 I would Love to win the adorable giveaway. (I never win Anything). I will read and drink and think of you if I am lucky enough to win. It sounds so interesting and the title is intriguing. I want this book! Thank you donamaekutska7@gmail.com I really want the mug! Its cool, the book is the best part. Love the title and that spoon!!!! A book and gummy Bears. Yay!!! Would love to read! Thank you for the chance to win. I really like your books. This looks like a great give away. Thanks. I really like your books. They are great. jsjacobson(at)prtel(dot)com. This is a new to me series and sounds great! Love the cover and catchy title-- Thanks for the opportunity! That's for the chance. Love the title and cover. You out did yourself. Thank you for the chance to win. This looks amazing. It sounds like a wonderful series. The book sounds great. Love the cover! I have never had any unwelcome guests. When I was young I just put up with unwelcome guests. I was chicken. As I got older, I started kicking them out. Your books sounds like a fun read. I can't think of any umwelcomned guests. For a while, we lived in a very small apartment so there was not even room for welcomed guests. We turned out 3 bedroom house into a one bedroom house so that my in-laws wouldn't have anyplace to stay if they tried to visit. Pretty extreme, but it worked. I love the cover! Sounds like a great book, adding it to my TBR list. Thank you for the opportunity to win this! Greetings, I am coming to through a post shared by Mary Anne Edwards and since I love her books, I shall check out yours. Have a fun day but be safe. linaka54 (at) shaw (dot) ca. Lovely giveway, the book sounds fun! Thanks for the opportunity! Been enjoying the Vintage Kitchen series. Haven't started this series yet. Need to get busy reading. Thanks for the chance to win not only a copy but an amazing giveaway. I haven't had any unwanted guests show up at my house. I don't know what I would do if that happened, I hope I would be able to handle it gracefully. Looking forward to reading "Muffin to Fear", sounds like a great addition to the series. 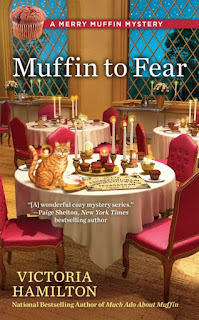 Love both the Vintage Kitchen Mystery Series and the Muffin Mystery Series. As a retired librarian I maintain a list of my favorite mysteries to share with my friends and fellow librarians and to make sure I ask my local library to order the most recent titles. Victoria Hamilton's books are always prominent on my list and even though I generally purchase them myself, I still request them from my library. I just love cozies! I like the title. Thanks for the opportunity! I liked, commented and shared on facebook. Can't think of a time when I have had unwelcome guests. I'm lucky. I never have people stay with me. I don't even have visitors! I have been waiting for this new one to come out. I am anxiously awaiting my 5th baby and need some good reading to help me pass the time. This sounds so fun and I love the title. Thanks for this giveaway! I love cozy mysteries that involve cats, coffee, or food! Unwelcome guests are still treated as honored guests. Thanks for the chance. Do family members count as unwanted guests LOL. All guests should be treated kindly until they leave which hopefully isn't too long. This looks like the best give away and a wonderful series. Fingers crossed. The book sounds great, and the prize package is wonderful. Such an exciting giveaway! Kastjd71 (at) yahoo (dot) com. Love this series! The titles keep getting better as do the books! Lovely giveaway package! Love these books! I just devour them. Have a marvelous release day! Love this series, looking forward to reading this book. Love the spoon! Can't wait to read the book, thanks for the chance! Thankfully, haven't had any uninvited guests. This sounds like a Spookylicious read & in a haunted castle to boot! BTW, I love all the goodies, the spoon is Super! I love the story and the cover is adorable! Great giveaway. Thanks for the chance to win. I would love to win. It would be great. You write wonderful books, and I can't read enough. looking forward to this series. thank-you for the chance. No uninvited guests here. Would love to win this awesome package! I'm lucky I never had an unwelcome guest. Thank you for offering this giveaway. I enjoy your books. I just try to stay out of the way until they leave. Thanks for the great giveaway. For unwelcome guests, I pretty much just say I'll chill in my area and you chilling yours and don't break anything. We no longer live in that house though so it's all good! This book sounds like so much fun. It sounds like a crew of well-known ghost hunters that some of us know and love so well! Ha! Those dudes are always fighting amongst themselves. Just hunt ghosts, you know?! This is one I will definitely want to read. What is the head hunter in the ghost haunt hunt inspired by any particular ghost hunter? I have a favorite one, but I'm going to keep that a secret the....Bag....teehee. This is a nice giveaway. I love meeting new characters and new authors. One of my favorite authors! I look forward to reading this. And that spoon!!! Awesome! Would love to read this book! Sounds like fun. thankfully I haven't had this issue, but I can imagine needing to take breaks away. Looks like the making of a lovely lazy summer evening. Thank you for the chance to win. It looks like a fun story and I would love to read it. No one ever comes to my house. We have a 140# Bull Mastiff that doesn't let anyone come in. He really is very sweet. Your Merry Muffin series is a wonderful to read, and love to read this new one!! While drinking a cup of tea in a mug that says it all, Cozy Up To Great Mystery, a perfect description of your series. Can't wait to read this! No unexpected guests here! Thank you all so very much for this **wonderful** response! I've chosen my winner. Love you ALL! !